This season’s non-conference schedule features a couple big-name foes who should live up to that billing, a pair of traditional rivals who are trying to rebuild, and a pair of potential land mines. The marquee non-conference foes are Kansas, who enters the season ranked #3, and Maryland, who won 24 games last season and received votes in the preseason polls. Both Connecticut and Georgetown are on the schedule again and the Orange will be looking for a measure of revenge after losing to both schools last season. Saint Bonaventure and Oakland are the “small schools” most likely to pull an upset. The Bonnies from the Atlantic 10 return Jaylen Adams and Matt Mobley, who combined to score over 39 points a game for last season’s 20-win team. Oakland, who received one fewer point in the preseason polls than Maryland, was a 25-win team last season, but will be without Jalen Hayes, one of their top players, for the matchup with the Orange due to suspension. Unsurprisingly, the ACC features five teams ranked in the top 16 and four other teams who merited at least one vote in the preseason polls. Duke sits atop the preseason rankings, while defending national champ North Carolina (#9), Miami (#12), Notre Dame (#14), and Louisville (#16) round out the cream of the conference crop. The good news is Syracuse faces each of those teams just once. The bad news is only North Carolina and Notre Dame come to the Carrier Dome. Virginia, Virginia Tech, Georgia Tech, and Florida State all received votes in the opening poll of the year. The Orange have a home-and-home with Virginia and host the Hokies, but face the other two on the road. The other five conference foes, who make the list of teams voted behind the Orange in the ACC’s media day vote, comprise the remaining eight conference games. SU has home-and-away sets with Boston College, Pittsburgh, and Wake Forest, as well as visits from Clemson and North Carolina State. Those first two teams are predicted to bring up the rear in the conference. 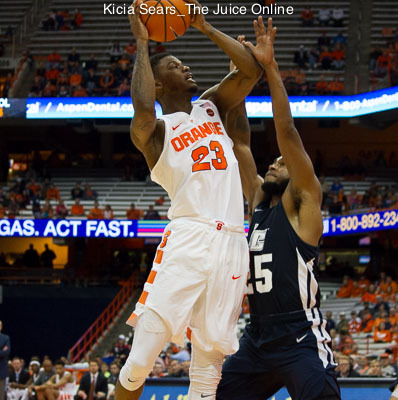 In other words, the conference schedule sets up almost as well as could be asked for a young Syracuse team, as the bulk of games likely described as “winnable” will be played at the Carrier Dome. And SU will happily take as much help as they can be given. The Orange are one of the least experienced teams in the nation and that comes a season after having a difficult time getting an experienced roster to play consistently well last season. There were several bright spots on display during the two exhibition games, but Jim Boeheim will need them to both show up more often and mesh together. 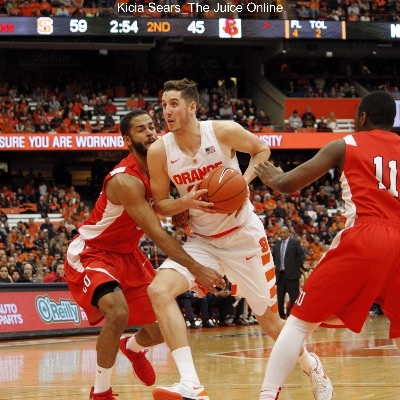 Tyus Battle showed the ability to score in bunches, even when his shot is not falling. His backcourt mate, Frank Howard, shot well enough from outside to suggest his perimeter game is coming along. 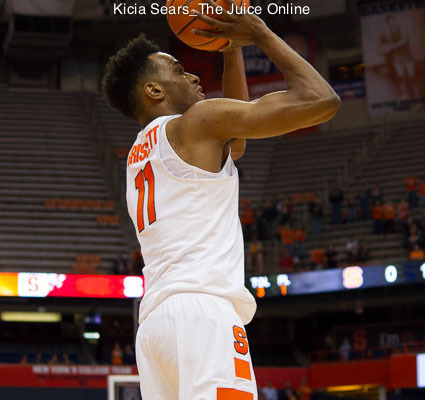 Oshae Brissett showed three-point range and great body control when driving, suggesting he will be a very important piece on offense. On defense, both centers showed shot-blocking ability while anchoring the baseline of the zone. Dolezaj helped made the press look quite effective in spurts. Even with a whole bunch of new faces, there were enough good rotations and traps in the halfcourt to show that the team is learning how they are supposed to play together in the 2-3 zone. At the same time, while some positive attributes are there on offense, they were not there consistently against two physically smaller teams who play at a lower level of competition. There is no post threat on the roster and many players seemed content settling for outside shots during long stretches of play or simply trying to do it individually without any regard for a functioning offense. When shots did not fall, the offense predictably stagnated. It is not a stretch to imagine that also happening against a higher level of competition when the regular season starts. In those exhibition contests, Boeheim leaned on his press a lot, looking to speed up the game, force mistakes, and get easy points to get the offense going. He also used a lot of different combinations of players, suggesting he may be thinking that the press will be needed more than usual to help the team on those nights when shots are not falling – and it looks like the potential exists for there to be a lot of those nights. In short, it will likely be another long season for the Orange. This young roster will have a hard time scoring for long stretches and the defense will go through growing pains at the same time. That is a bad combination for playing in the ACC. Overall, this team will probably finish at .500 or slightly above with a below-.500 record in conference play. While last season’s NIT berth was a disappointment, getting there this time around will be a plus. With only Thorpe guaranteed to not be around next season, reaching the postseason and giving this young roster more opportunities at game experience should be viewed a plus as the program rebuilds.